Longhorns are 11-1 in the all-time series against the Cyclones. After close calls in 2013 and '14, Iowa State fans probably feel their team is due. This has been a transformative month for the Texas football program. Perhaps the key moment came when coach Charlie Strong finally saw anger in the Longhorns’ eyes after starting the season 1-4. Two victories later, the Horns (3-4 overall, 2-2 in the Big 12) aren’t exactly beaming about their improved status. They’re mad, mainly at themselves. This is how the Longhorns should have been playing from the start, several players said after Saturday’s 23-9 win over Kansas State. For the second straight game, Texas dominated the line of scrimmage. The offense ran for 274 yards in ridiculous conditions, and the defense smashed the Wildcats, totaling five sacks and allowing only four of 14 third-down conversions. Next comes a Halloween trip to Iowa State, a 2-5 team that held up rather well against No. 2 Baylor in a 45-27 loss. The Cyclones are fighting for coach Paul Rhoads’ job. Two weeks ago, Iowa State had TCU on the ropes before the fifth-ranked Frogs came alive in the second half. Iowa State fans probably believe they’re due to get one against Texas. In 2013, the Cyclones felt robbed when UT’s Johnathan Gray fumbled at the 1-yard line in a close game. Iowa State recovered the fumble and celebrated as if the game was over. After a long review, it was determined Gray’s knee was down. Gray fumbled on the next play, too. He recovered that one with no controversy. Then, Case McCoy plunged over the goal line on a 1-yard quarterback sneak with 51 seconds left, and Texas captured a 31-30 win. Last season, the Cyclones thought they were headed to overtime after tying the game on E.J. Bibbs’ 11-yard touchdown catch. 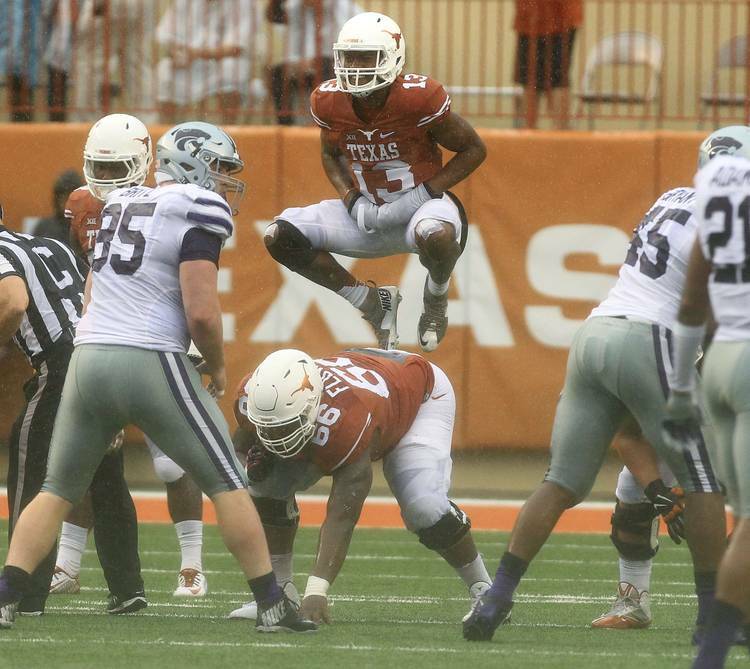 But UT’s Tyrone Swoopes threw back-to-back whoppers, a 39-yarder to Jaxon Shipley and a 29-yarder to John Harris. Kicker Nick Rose hit a 21-yard field goal with 3 ticks left, and Texas escaped with a 48-45 win. Texas is 11-1 in the all-time series against Iowa State. The only loss came in 2010 during UT’s miserable 5-7 season. Strong delivered a hard message to his players before facing Kansas State. The Horns still have room for improvement, mainly in the passing game. Texas mustered only 55 passing yards against Oklahoma under a blue-clear sky. The conditions Saturday were dreadful. Jerrod Heard didn’t complete an over-handed pass until late in the third quarter. He finished with 99 passing yards, many coming on short under-handed flips to Daje Johnson. It’s worth exploring whether backup Tyrone Swoopes can execute different passing plays out of his short-yardage “18 Wheeler” package. K-State wisely packed the line of scrimmage whenever he came in, and made him earn three rushing touchdowns. More than anything, the players have established a clear identity. The Horns believe they’re on the right track with a two-game winning streak. “It’s really about taking that emotion and that pride we played with against OU and keep it going the rest of the season,” cornerback Duke Thomas said. For a larger look at Saturday’s final stats, click here.